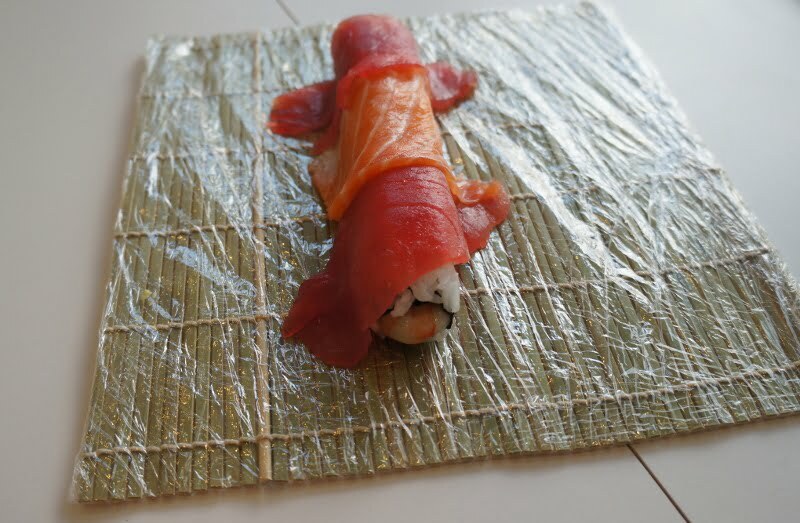 "Company Roll" Sushi Recipe @ Best sushi roll in the world! "Called this one "Company Roll" because it has two different toppings. And three's a crowd. It's a great looking roll that 'has everything', great for those who can't easily choose just one thing in their roll." 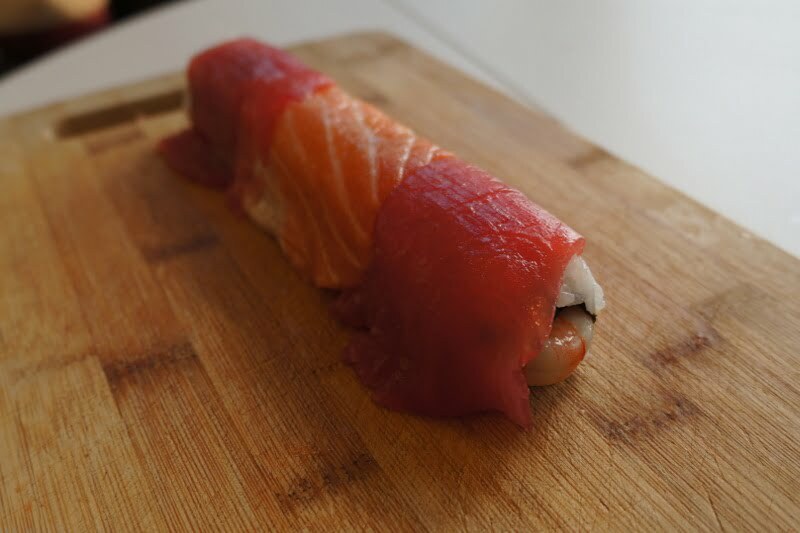 This is a brilliant sushi roll with everything sushi fans love, in and on it. So what is it? Basically, prawns and avocado on the inside, with both salmon and tuna on the outside, topped with ikura for the looks and flavor. Got your avocado sliced up and prawns washed up? Brilliant! Let’s line ’em up. As you can see I used very thick slices of avocado, that’s just the way I like it. 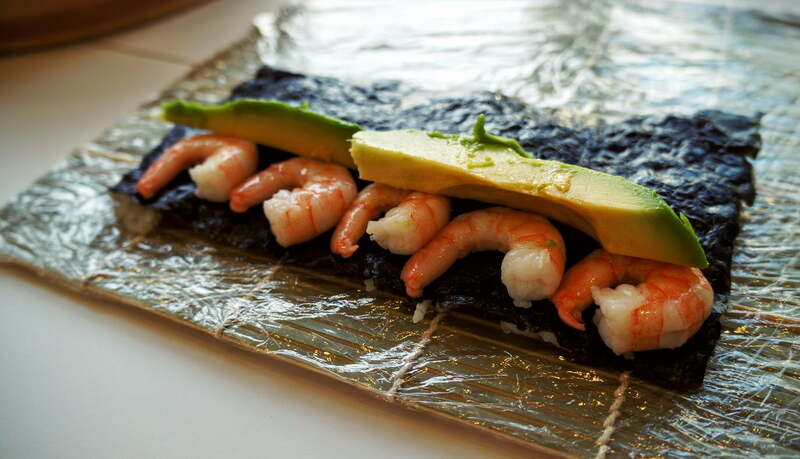 As for the prawns, if I made that roll now would place them “tail into tail” to avoid the extra space between them. All lined up? great. Now it’s time to roll. If you got all the way here, you probably know how to roll sushi by now. Just in case you are not 100%, have a look at the animated GIF below. The sharp eyed among you may notice it is from a different recipe page (Spicy Tuna actually), but it’s the same trick. Lift the mat with your thumbs holding the sushi filling with your fingers and close the roll. Tighten the mat on the roll from the ends towards the center (to avoid squeezing the filling out) and open a flap in the mat. Push the mat forward so rolling the roll inside the mat, and tighten again. Repeat a third time if required and you are done! 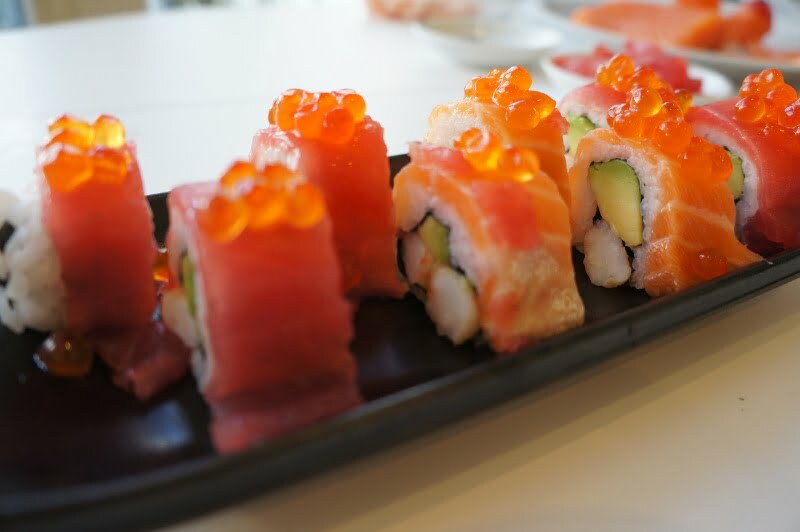 If you are still not sure about this part, have a look at our inside sushi making guide. This is my favorite part, topping up. 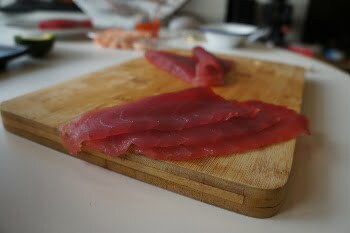 First prepare wide and thin slices of tuna and salmon. You can see below my cutting is, well, far from perfect. 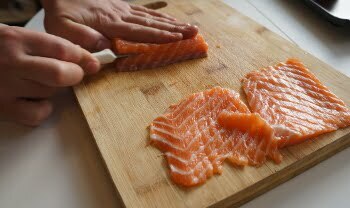 I’m using a regular kitchen knife here, but a long fish knife would have helped making cleaner and nicer cuts. Next, you would want to place the slices on top of the roll we just made. Try to overlap them a bit, but not too much – half a centimeter overlap will do the trick. Yes, big big slices, that looks great! Now use the mat to tighten the fish slices to the rice. Tighten well so it doesn’t fall off when you cut the roll in just two seconds. Pressed again the rice, the outside of your roll should now look something like the below. You are almost there. Now it is time to cut the roll into pieces. Usually 8 or 6. Depends of you are keeping the end or not. I usually do. If you are having trouble cutting the roll without everything falling apart, there is a trick that might help. Try placing a saran tape on top of the roll, tighten it with the rolling mat, and cut through it. That usually helps a lot. In any case, when cutting the roll it is important to keep the knife clean and wet in between cuts. That really helps. Ikura is the perfect top-topping for me, but you could also try black sesame, chopped green onions or anything that come to mind. You could touch it with some teriyaki sauce, that wouldn’t hurt I’m sure. If you liked this recipe, check out more recipes below and leave comment. And share. And be happy. I would really like an ingredient list with specific quantities and measurements please. 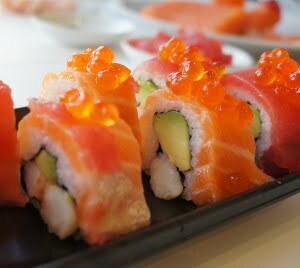 Best sushi roll! Love the combination of the different fish in one roll. Really great to learn making company roll. I wouldn’t learn this without the recipes here. I’m grateful. Interesting! I think I can try making this company roll now myself with this guide. Thanks a ton for sharing! Hey… Thanks for the guide. My friend makes this Company Roll so well but has refused to teach me I will sure surprise here with this. Let me go try it. Thanks! This is mouthwatering – going to attemept it tonight!